In a sword fight, if you get the opportunity to prevent your enemy from attacking again soon, you should take it. More importantly, you should take it with the Medieval Parrying Dagger, which is designed to catch an enemies sword. 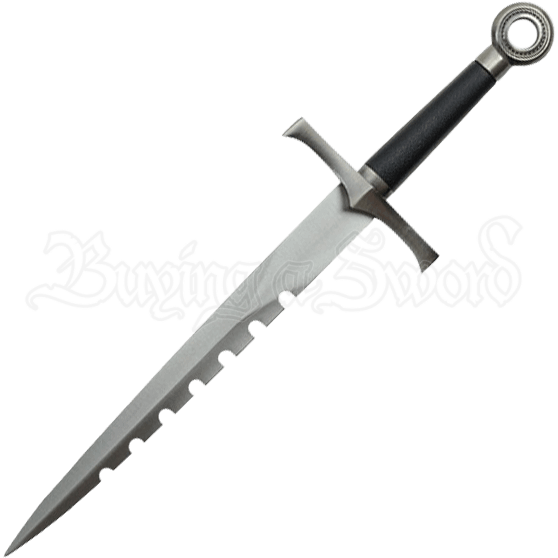 This sword breaker style parrying dagger is made from stainless-steel and features seven serration-like grooves in the side of its needle point blade that are designed to catch your enemies sword. The cruciform hand guard and ring-shaped pommel of this off-hand weapon are made from cast metal. The scabbard that accompanies this defensive weapon features cast metal caps on the tip and the throat. Add this handsome steel dagger to your collection or use it as a Ren Fair accessory!